One in a million. That’s how many recruits survive Grey Knight boot camp. And if you consider that those recruits are the top percentage of those already chosen from their home worlds as being the top specimens on their respective planets, the numbers start to get a little crazy. The entire population of Earth would probably yield barely a single Grey Knight – rounding up. 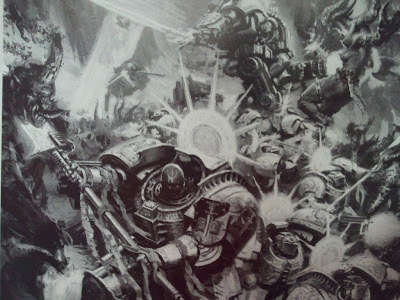 That’s a whole lot of sacrifice for a single marine in silver armour, but then who else is going to remember the ever-changing names of every Daemon in the Warp and throw it in their faces? 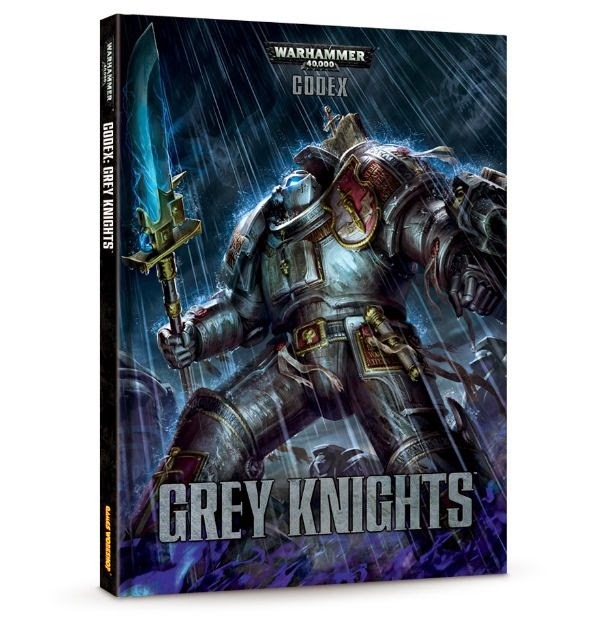 The new Grey Knights Codex describes such details to give you a better understanding than ever before of lengths the Imperium has had to go to in the endless war for its soul. On reading through the background of the frankly beautiful book, I was surprised at the number of excellent additions to their background – a stellar map showing the locations of the known daemonic incursions and Warp storms throughout the galaxy, a detailed breakdown of the Chapter’s fighting strength, descriptions of all the Brotherhoods, plus the names and duties of each Grandmaster and their second in command Brother Captains, a double page spread on understanding their Heraldry with examples and ideas on creating your own. It goes on and on and all works to impress upon you just how few and individual they are, and the magnitude of the task they face. Their Chapter breakdown reads with some very specific numbers, such as 44 Purifiers and 98 Paladins – in the entire galaxy. Even when reading the same lists for marines you’re still somewhat safe in the knowledge that there are at least another thousand or so other Chapters out there to lend a hand if someone screws up. It’s all wonderfully compelling knowing just how close humanity teeters on the edge of its doom, and the individuality the book enables you to impart on your small army of ‘man’s greatest, and fewest, heroes’ creates a firm link to the consequences should you fail. The fantastic new artwork does a much better job of portraying their supreme fighting ability (the first double page piece is particularly impressive) and lends itself well to the idea that they are extremely proficient at killing daemons – but constantly under threat of being overwhelmed by the never-ending hordes they struggle to hold back. Usually only barely a handful of Grey Knights will be sent to deal with a potential incursion which their prognosticators can foresee (kind of like ‘Minority Report’) which enables them to show up at the right time with the minimum of force to get the job – so precious is each and every Knight – and only the greatest and most threatening of incursions warrants the mustering of a full brotherhood. If I’m honest, I was disappointed with the photography. Someone got a little carried away with the lighting effects and there was no showcase of individual models which is always one of my favourite sections of an army book – I’m unsure if this is consistent across the new format Codicies but it’s not a change I’m happy with as I get a lot of inspiration from the individual efforts of the ‘Eavy Metal team. There‘s also what look to be not one, but two non ‘Eavy Metal, and I guess ‘reader/staff submitted’, armies used in the photography and the quality just isn’t there. They are great armies that anyone would be proud to own (although I’m not sure about the one with all the trophy racks, seems very Chaos) but in a premium book I expect premium quality throughout. Onto the army list and there’s quite a bit of change, and you can expect a mixed reaction from existing Grey Knight players. They had a reputation as one of the stronger armies in 40k and everyone was expecting them to be toned down – and this has indeed happened. All the Inquisitor stuff has gone completely – even down to the fluff, with only a slight link to the Inquisition being maintained. Most of the equipment and upgrades has been wiped away, no more Psycannon Bolts, or Rad grenades, or Brain Mines, it’s all gone along with all the Grey Knight specific Vehicle upgrades. It’s a bit of a shame as not only is there still a mention of the more exotic pieces they use in the background, but it seems a lot of the army identity has now gone into the Psychic phase removing most of the choice you had in how you played with them. Non Grey Knight players will be happy to hear the (now) Lord of War choice, Kaldor Draigo has had his wings clipped. He’s still a beast but no longer strength or toughness 5 – again, as much as this was perhaps needed, it’s still a shame to see perhaps the greatest Marine in the Galaxy reduced to a majority stat line of 4’s [I think most Space Marine players would argue that point by go on… – Ed]. You’ll be kept busy re-learning the points costs of the basic elements of the army as there’s ups and downs all over the place. Some changes of note are Grand Masters have gone up slightly and trade-off their Grand Strategy for psychic level 2, whereas Librarians have gone down by a whopping 40 points – and a further 25 less for a level 3! Strike squads have gone up but their equipment options have gone down so you’re still better off, and Terminators have gone down significantly but lose out on the changes to the Nemesis weapons – which is swords now have no benefit beyond being a Nemesis Force weapon and Halberds are +1 Strength instead of +2 Initiative – so the Terminators are now either less durable in combat or a lot slower. Purifiers went up slightly and the Apothecary for the Paladins is now a massive 55 points less – which equates to a free Paladin! Other highlights include special weapons now being consistently priced, which actually makes equipping one on your HQ a feasible option, and the Dreadknight has been given the sales boost treatment as you can now take a tooled up teleporting monstrosity for, on average, 70 points less! The Vehicles are largely unchanged. Generally the list seems to be pushing you to take more from the troops choices which is a good thing as there were some big errors in the last codex which made taking Purifiers over Strike Squads a no brainer. And with Terminators getting worse but cheaper, it’s now a harder decision to choose between the two troops choices. However, the adjusted force organisation means you only need one as a compulsory choice and gives you an extra Elite slot at a cost of one less Heavy and Fast Attack – go figure. I said before, it’s a shame to lose all the toys and although the Relics are some consolation, it’s taken away some of the individuality from the HQ’s that the background did such a job of adding to them. With less being spent on your HQ and generally cheaper units overall you’re army should be larger but will rely even more on the Psychic phase to assert itself with a number of units now having access to multiple powers – and a Librarian should still be the first name on the team sheet. Beyond him and perhaps the Dreadknight, the army balance is a lot better with more of the choices being just that, rather than easy hits and misses, and I’m looking forward to getting some more models on the table – but man am I going to miss those Rad Grenades.